Summer has faded away and your floors aren’t looking so great now that they’re no longer bathed in beautiful summer sunshine. Frustrated that the kids are tramping in mud, the dog scuffing things up, and everyone else just adding to the wear and tear? Fed up of spending far too much time each week cleaning, polishing and patching up your beleaguered floors? Not to worry, all you need is some new, hardwearing flooring. And today that doesn’t mean you have to stick with stone. Modern wood and vinyl flooring options that work whatever the weather are available in a range of styles, so you can take your pick. Go with engineered wood to avoid problems with moisture as the weather gets wetter. Engineered wood can give you the same effect as solid wood as its top layer comprises a veneer of solid hardwood. But beneath the veneer are thin layers of plywood glued together; this design is what makes engineered wood less prone to warping in the face of changing humidity. This is also what makes it able to withstand lots of footfall, whether that’s from a houseful of pets, a growing family or all those visitors popping in and out. Kährs is considered by many to be the go-to supplier of engineered wood as they have been in the wood industry for over 160 years and were the first to produce engineered wood flooring for the mass market. If you are on a tighter budget, laminate flooring is another option worth considering. Advances in technology mean laminate designs are closer in appearance to real wood, for example, the use of more deeply embossed wood grain effects. 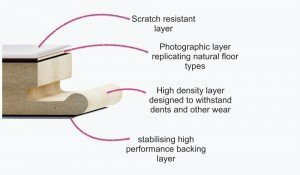 A leading brand in laminate flooring is KronoSwiss, who supply a range of textured finishes. Vinyl has come a long way since the days of flimsy rolls in gaudy patterns. Today it is stronger and more durable and that is due to the innovation of LVT, otherwise known as luxury vinyl tile. LVT can be made to mimic the appearance of wood, stone or ceramic so your kitchen doesn’t have to look like it just stepped out of the 1980s. Multiple thin layers of vinyl are bonded together, so you get flexibility and comfort underfoot but not at the expense of durability. Waterproof and resistant to wear and tear, LVT is ideal for heavy-use areas, so its perfect if the kitchen is the heart of your home. Like regular vinyl, LVT is resistant to dust mites, which is handy if you’ve got dogs or cats at home as our furry friends are prone to developing dust mite allergies. Amtico’s range of LVT flooring has styles to suit every home, whether you want to go rustic, modern, or anything in between. If you’re considering a new floor for your home and would like to discuss your flooring options, get in touch today on 0113 333 9022 or check out our Contact Us page. What Underlay Is Best For My Floor?